Ogden Water Local Nature Reserve is located 4 miles North of Halifax, on the A629 Keighley Road. Turn along Ogden Lane, follow this along and then head right into the car parks at the end. Ogden Water is owned by Yorkshire Water with the surrounding woodlands being on their behalf by Calderdale Countryside Services. There are numerous woodland trails and waterside paths to explore, including 1 ¼ miles of wheelchair accessible pathway around the reservoir and through sections of the woodlands. If you get up high to the edge of the woodlands you will be rewarded with stunning views extending across Calderdale, Bradford and as far as Selby and the Peak District. Ogden Water is a Local Nature Reserve. The estate comprises a 34 acre reservoir enclosed by woodland with open moor beyond. The heather uplands and peat moors form part of a Special Protection Area that is of international importance for breeding birds such as curlew, snipe, grouse and various birds of prey. Over 300,000 people, (and increasing! 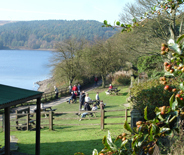 ), visit Ogden Water every year for walking, picnics, family outings and nature activities. A small visitor centre and toilet block is located on the roadway from the car park to the dam wall. This is run by volunteers and aims to be open everyday from 10am until 3.30pm (later at weekends and in the summer if the weather is good!). It sells sweets, drinks (hot and cold), ice creams, books and souvenirs. This is also the point to pay for parking. There are over 2 km of wheelchair accessible paths around the reservoir. Parking for wheelchair and scooter users is available outside the Ogden Water toilet block. This is located on the left hand side as you go down Ogden Lane towards the reservoir dam wall. Car parking, including designated disabled parking. Three permanent orienteering courses. Maps from the visitor centre shop. A range of walks, from easy to strenuous covering both the estate and further afield. Pick up a pamphlet at the visitor centre shop. Picnic tables and benches along the reservoir and woodland trails. Bird feeding area in the picnic area and over the wall from the visitor centre. We also have a duck feeding area outside the centre and sell duck food as well. Countryside Education Centre and Schoolroom. A multipurpose venue available to community groups, organisations, private business etc., for learning, education, development and training. The Centre can comfortably accommodate 30 adults or 35 children, and can be booked for the day or evening. The Centre is automatically available to schools and groups booking environmental education activities at Ogden with the Calderdale Countryside and Woodlands Team. People who wish to book the classroom should ring Julie Swift on Halifax 01422 284415. Please don't hesitate to get in touch to make a booking or for further information.